CHASING FOOD DREAMS: Lek Lek Restaurant, Seri Kembangan: Back for More Goodies! Lek Lek Restaurant, Seri Kembangan: Back for More Goodies! Back for a Second Gluttony Feast at Lek Lek! I am back for more! When my First Visit at Lek Lek Restaurant had me swooning on cloud nine, it was only pure excitement to check out what was in store at this unique Chinese restaurant in Seri Kembangan. It was a powerhouse that night as lots of VIPs and VIFs (Very Important Foodies) congregated at Lek Lek Chinese restaurant on a rainy evening for a spectacular feast of the unknown. Chef Jeffrey and his kitchen team have prepared a long list of his creative dishes to awaken our taste buds. The menu remained a secret as each dish was presented course after course. Rest assured, we had fun guessing our food and savoring them as well! First course was the essential elixir of broth, Double Boiled Black Tiger Palm Soup. No, we did not have any illegal dinner but rather it’s a type of fungus named aptly Black Tiger Palm just because it resembles the tiger’s paw. 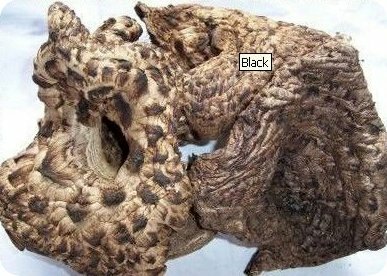 Said to own the effect of preventing cancer, cleanse blood and reduce cholesterol level, the Black Tiger Palm fungus originates from Sichuan Province of China. The mushroom contains essential amino acids and essential minerals and is widely used in traditional medicines. The broth had an intense aroma of earthy flavors from the Black Tiger Palm, the jet black piece on the far right, coupled with chicken, mushroom, and other Chinese herbs. Double boiled for hours, all of the essence of the chook and herbs has permeated the broth with intense richness. Ultimately soothing and warming to the tummy, the broth was a delicious starter for some revitalization. The second course was fish, huge chunks of it named Black Bean Grouper. The fresh and sweet pieces of grouper was nicely sauced up with a saltish black bean sauce spiked with bits of chili, garlic, onion, spring onion and crispy pieces of bean curd puff. Lots of textures going on in the dish to match the flavors, the dish is really aromatic and sumptuous. Roasted Nam Yue Chicken is another classic. Usually done up with pork, Chef Jeffrey went with poultry for a different touch. The whole bird is marinated with the classic Chinese fermented bean curd and roasted. The skin is rendered to a beautiful red amber hue and crisp up nicely. I found the flavor to be a bit bland but the meat was juicy enough. Last time it had me at ‘Hello’! This round, I am still impressed by the Pan Fried Garlic Snails. Equally ravishing like the first time, these little gastropods are juicy, spicy and salty all nicely pumped up. It also has a pungent garlic sensation with the loads of minced garlic enough to scare off any vampires. Takes a bit of chewing but its well worth the bite! A Ying and A Yang preparation of fish were artfully decorated by lots of colorful vegetables. Fish fillets were steamed in black pepper with Shimeji mushrooms for the first cooking style of Steamed Black Pepper Fish Fillet. The steamed method, Stir Fried Black Pepper Fish, had a good balance of pepper and sweetness, making the dish fairly light and easy to enjoy. The second flavor showcased pieces of the fish with bones stir fried and coated with a spicy peppery dark sauce with garlic, onion, spring onion and chili. This one had more oomph because of the textures and the piquant flavors. A repeat for me, I gladly enjoyed the Fish Paste Stuffed Mackerel. Whole mackerel deftly deboned and stuffed with its own fish paste was fried to a crisp and doused with a savory sweet soy sauce. I adored its bouncy texture and flavorful fish paste tremendously. More pork… at this point, I lost count of the number of dishes we ate. Basically a whole pork rib was marinated and deep fried before being dressed in a sweet and savory sauce. Aptly named Yat Zi Guat, the ribs were beautifully caramelized and tender. Biting into it had juices oozing out while the aromatic caramelized sweetness shined beautifully in my mouth. Yum… a favorite of the crowd that night! Sautéed Shredded Pork with Celery was scrumptious! Talking to a person whose not a fan of celery, I actually thought the celery matched perfectly with the thinly cut strips of pig stomach. This dish had lots of crunch with bell peppers, celery and carrot. The thin pig stomach was tender enough to match the vegetables while exuding sweet fresh flavors with a peppery hint. I would order this again on my next return. This one was mysteriously delicious! We just could not figure out what this was till the chef told us. In fact, a lot of us were munching happily until we found out the ingredient. Frog skin prepared in two sauces was really executed very well. Every piece of the skin was so crispy and light that it could have been fish skin for all we know. The first on was a Salt and Pepper Frog Skin and the second was Frog Skin in Honey Sauce. Both frog skins were equally good on its own with one more savory and the other sweet. I was at lost for words when I found out… but to be fair, it really tasted yummy and quite addictive. The twelve dish of the night was a classic Hokkien Mee. Although ready to burst, I just could not resist a few bites of Hokkien Mee. Will you take a serious look at the fried pork lard? It makes my knees go weak and my heart skips a few beats. Chef Fai does a mean Hokkien Mee. Well braised with dark sweet soy sauce, the slippery thick noodles called for some serious slurping while bits of the pork lard added more sin to the dish. A Must-Order at Lek Lek Restaurant! Petai Fried Rice was the last dish of the night. A chef specialty, the fried rice had good breathe of wok and aroma from its list of minced ingredients. One can hardly detect the stinky beans or Petai, making it pleasantly enjoyable. The rice is spicy and robust in flavors from its medley of stinky beans, dried shrimps, bbq pork, long beans and chili. Omigawd!!! The yat zi guat!!! Slurpsssss!!!! some of them are just delicious!! what would you order from this list?? nice!! the food does look creative. the only problem is i don't know my way to seri kembangan =p pai seh.. MOUTHWATERING~!!! omg im on diet man and im feeling hungry now!